A report released today by the U.S. Energy Information Administration (EIA) points to production from U.S. tight oil plays as key drivers to projected increased domestic oil production over the next two years. Specifically, EIA projects the Permian Basin in West Texas and Eagle Ford Shale in South Texas to be the top performing tight oil regions through 2018, with the Permian showing the greatest potential for growth. According to the EIA, U.S. oil production will increase from about 8.9 million barrels per day (b/d) in 2016 to roughly 9.3 million b/d in 2018. While almost half a million barrels per day is a notable increase, even more significant is where the agency expects these gains to be derived: tight oil from shale development in Texas, North Dakota, Oklahoma and New Mexico, as the following EIA graphic illustrates. While the Permian’s production is nothing short of staggering, the Eagle Ford is certainly nothing to overlook. As the second highest producing tight oil region in the United States, the Eagle Ford produced 1.3 million b/d in 2016. 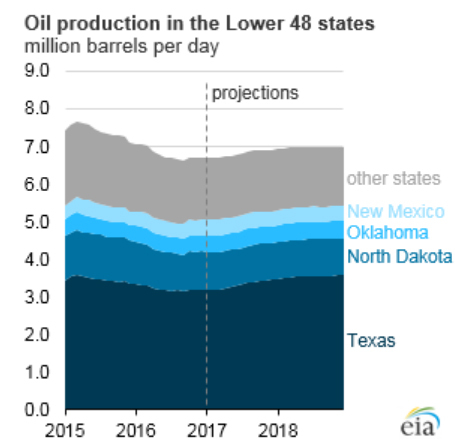 Looking forward, EIA expects this level of production to stay relatively the same through 2018, meaning Texas will maintain its spot as the top producing tight oil state. With a bright outlook for Texas energy production in the coming years, experts expect the industry to improve and activity to continue to rise. According to the Dallas Fed Energy Survey published by the Federal Reserve Bank of Dallas in December, the Texas oil and gas business activity index – a broad measure of conditions facing energy firms in Texas – rose to 40.1 from the previous quarter’s reading of 26.7. But a measure of energy firms’ outlook on the industry is just once piece. Even more telling is that the state added an estimated 3,000 oil and gas jobs in November and December of last year. So, while the oil and gas industry might still be facing headwinds from low commodity prices, between new job growth and substantial tight oil production expected from the Permian, one can’t help but feel optimistic for the future of energy development in the Lone Star State.